What would it be like to witness first-hand the creation, the flood, and the crucifixion? The discovery of a mysterious old book takes Elkan on an unforgettable quest. His guide, Captain Kamali, needs Elkan’s help. Elkan is responsible for finding seven keys that fit the seven locks of a secret chest. Though this task seems nearly impossible, the reward for its success is immeasurable. They must open the chest and get the treasure to its rightful owner before it is too late. During his journey, history is revealed to Elkan like never before, as he experiences it first hand. 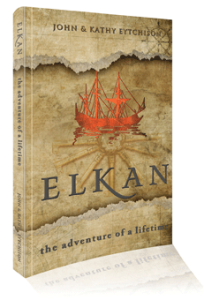 Travel with Elkan as he takes a journey back in time, one that will change his life, and yours, forever. John has a bachelor’s degree in Journalism with a minor in Marketing. He is the Marketing Coordinator for a non-profit organization in Northern Kentucky. Kathy has been a stay at home mom for the past ten years. They live with their two sons, Evan and James, near Cincinnati. John and Kathy consider their children of utmost importance and desire for them to think for themselves instead of blindly following everything that the world tells them. Their greatest joy is knowing that their children walk in the truth.